The beautifully styled window displays here lure tie-dye swathed tourists and neighborhood regulars alike: a fur-lined tartan coat one week, a crinoline-lined belted '50s dress the next, a World War II uniform—all surrounded by dated treasures and knickknacks. The shop is shoebox sized, but well stocked with finds from the '40s to the '70s: winter coats (wool and fur), cropped jackets, '50s skirts and dresses, and old fraternity garb. 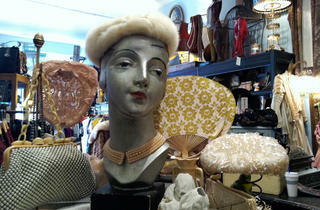 Netted, feathered and felt hats are draped across antique mannequin heads, and beaded clutches glint from the shelves. 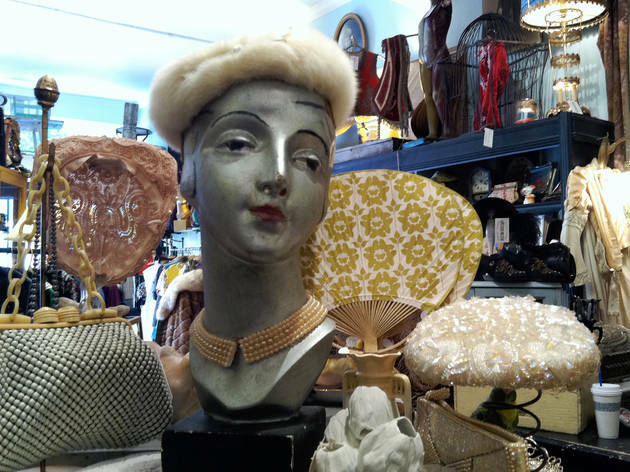 A bureau up front bears vintage postcards and vintage photos, costume jewelry and antique bottles and decanters. In the late summer months leading up to Burning Man, the assortment takes on a bit of a Steampunk air, punctuated with feathers, fur, Victorian ruffles and leather.